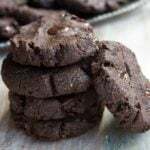 Moist and chewy, these almond butter brownie cookies are the most satisfying Keto chocolate cookies you'll ever try. Thick, fudgy and made with only 5 ingredients, this easy recipe is sugar free, gluten free and diabetic-friendly. Preheat oven to 175 Celsius / 350 Fahrenheit. In a bowl, mix almond butter, cocoa powder, granulated sweetener and the egg with a fork until well-combined. If your mix is crumbly, thin it with up to 3 tbsp almond milk. The batter should look fudgy and soft, but not runny. Whether you need the almond milk will depend on the texture of your almond butter. Roll balls with your hands and press them down on a baking pan lined with parchment paper. My cookies were around 1 cm high and had a diameter of ca 6 cm. Bake 10-12 minutes until the tops of the cookies begin to show little cracks. Let them cool completely before handling. The cookies are VERY SOFT when straight out of the oven but firm up as they cool down. If you cannot get hold of sugar free chocolate chips, you can use chopped sugar free chocolate or dark chocolate with a minimum of 85% cocoa solids. You only need to thin the almond butter cookie dough with almond milk if it looks crumbly. (The dough texture will depend on how runny or firm your almond butter is.) Don't use more than 3 tbsp or the cookies will become too fragile. Alternatively, you can use 1 tbsp of melted coconut oil.